Once again, on August 1, 2013, the taxpayers of Chicago paid for a complete media package from the city's mayor, mediagenic Rahm Emanuel. 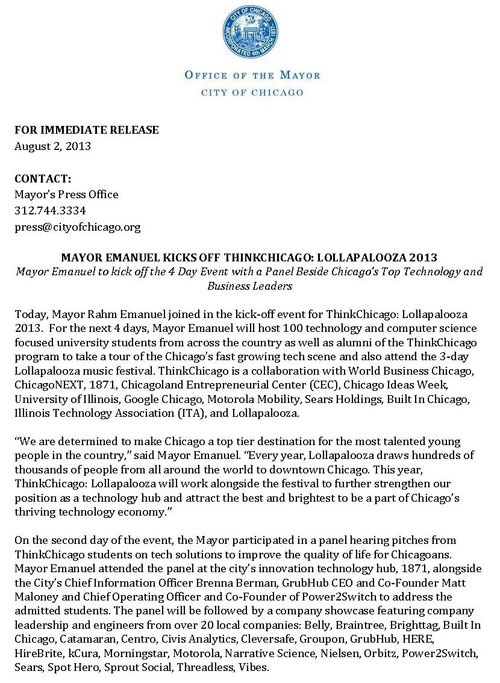 Once again, at taxpayer expense, the mayor's media team issued a press release which constituted a complete "news" story for lazy reporters or editors and owners who were in the tank with Rahm Emanuel and the Rahm Emanuel propaganda juggernaut. The press release also included the usual two mandatory photographs of the city's mayor, smiling and surrounded by a diverse group of smiling children. So while more than 10,000 of the city's children, including more than 2,000 disabled children, are going through the largest school closing in the history of the United States, the Chicago propaganda machine grinds on, preparing the public for Rahm Emanuel's move to become President of the United States. Today, Mayor Emanuel visited children at the Chicago Park District’s Northerly Island Park, where he took part in the activities of the Urban and Wilderness overnight camping program. This summer, thousands of Chicago children continue the learning process and stay active as part of Chicago’s Summer of Learning initiative, the largest coordinated summer learning program in the country. Mayor Emanuel met with 8- 11 year old Urban Campers 13 to 15 year old Wilderness Camping group, as the children participated in kayaking, fishing, archery, tent pitching, fire wood gathering, overnight camping and other camping activities. As part of the Chicago Summer of Learning, the campers will receive science badges to recognize their ongoing learning efforts. In addition, Northerly Island Park also includes programs for Adventure Campers (ages 6 to 12), and Bicycle Adventure Campers (agers 12 to 14). 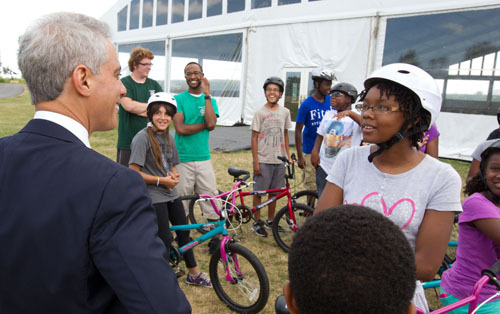 Photo Caption: Mayor Emanuel visits with children at the Chicago Park District’s Northerly Island Park Day Camp.